By far the best tools and cleaning chemicals to improve your business performance! CHOOSING THE RIGHT JANITORIAL PRODUCTS. Choosing the right cleaning chemicals. At Contract Cleaners Supply, we help you Clean It! Keep your workspace clean and tidy with a variety of cleaning and janitorial supplies, including all-purpose cleaners, paper products, paper towel dispensers and more. Keeping a wide array of cleaning supplies helps you maintain a professional appearance and prepares you for any mess that comes your way. Maintain Sanitary Conditions to Protect Employees and Clients — Unsanitary conditions in the workplace can lead to a variety of illnesses, resulting in missed work days and a negative atmosphere in the workplace. Hand sanitizers, disinfectant sprays and hand soaps help to prevent the spread of germs, and facial tissue helps to contain coughing and sneezing to stop the spread of infection. Keep a Clean Workplace — A clean, organized work environment helps workers to feel more productive and imparts a positive impression on clients and guests. Paper towels, trash bags, trash cans, ash urns and vacuums make maintaining a clean workspace a snap. Be Prepared for Any Accident — Coffee spills, food spills and other accidents are unavoidable, but you can be prepared for any messy situation with the right cleaning supplies. Stock up on cleaning wipes, hard wound paper towels, mops and brooms to clean up an unexpected mess in no time. Contract Cleaners Supply has what you’re looking for at the right price. 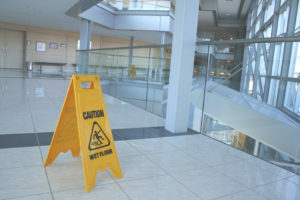 Preparation is important when it comes to mopping, especially in the janitorial business. Janitorial staff needs to have all the right cleaning tools on hand. We carry buckets, wringers, floor signs and cones, wet mops, dust mops, sponge mops and janitorial carts to help with your cleaning. Kitchen spills, food splatter and unwanted floor markings can be removed more easily with the right wet mop in hand. Of the most common types of wet mop heads available, one should understand both the positives and negatives of each. We can help you decide which head is best for which job. We carry cotton, rayon, synthetic and blended yarn mop heads. When looking to buy that wet or dry mop, surface cloth or a particular style of duster, the two most popular types of fibers that go into those products are microfiber and cotton. Each type of fiber is designed to clean a specific way. We can help you determine if microfiber is right for your cleaning needs. Whether it is sweeping out your dusty loading dock, messy kitchen floor or pesky debris from your sidewalk, knowing which type of bristle your broom will have will determine what products are right for which jobs. We carry several types of specialty broom bristles for any situation, including nylon, polypropylene, tampico, horsehair and palmyra. Clearing out cobwebs from ceilings, dirt behind your refrigerator or debris on top of ceiling fans can be simple jobs to perform if one has the proper duster in hand. Not every type of duster can be used for simple dusting jobs. Each duster has been individually designed to clean a specific something. Understanding the different types of dusters will help you determine which one is right for the job. We carry cobweb, extend-to-reach, pipe, split, feather, counter and hand dusters. Need help choosing the right janitorial equipment? We can help.